The Green Bay Phoenix fell behind early and would never catch up in falling to Purdue 74-62 in the opening round of the NCAA Women’s Basketball tournament in South Bend, Indiana. The Phoenix missed their first seven shots to start the game and shot just 32.9% from the field. The Boilermakers shot 51.2% overall, 50% from three-point range (6 for 12) and 86.7% (26 for 30) from the free throw line. Purdue did have 23 turnovers that Green Bay converted into 18 points. 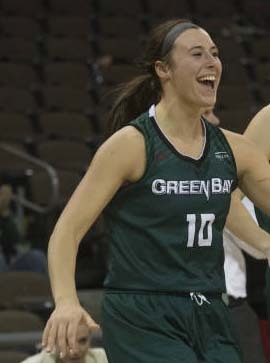 Senior forward Mehryn Kraker led Green Bay with 23 points. Junior forward Jessica Lindstrom had 15 points and 12 rebounds before fouling out. Green Bay was hoping to beat the Boilermakers and get another shot at No. 1 seeded Notre Dame. They lost to the Irish in South Bend earlier this season by four points.